Jensen Kimmitt and Patrick Mitchell. This is Patrick Mitchell’s 7TH CA State Champion Victory! Jensen of course destroyed competition after just recently taking the Pacific Northwest Regional two weeks ago – a true force to be reckoned with in any competition. Full results are below. Special thanks to Chris Allen of YoYoSkills again for running what sounds like an amazing event and giving $2000 away in CASH. One of the largest ‘winnings’ available at a yo-yo contest in a very long time! 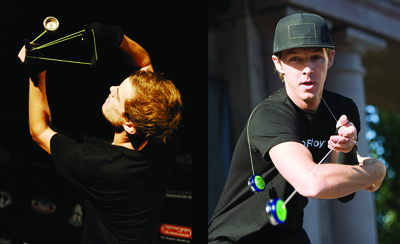 The 2010 California State Yo-Yo Contest takes place TODAY and is offering the largest cash prize for a yo-yo contest in a LONG TIME! Each division winner (1A and Open) will take home $1000 CASH sponsored by Pocket Pros [Razor USA], a company known for the original Razor kick scooter. We will update this post later today with the winners of the event! Many ‘pros’ will be there battling it out for the chance to win the $1000! YYF GLOW Collection! New Metal Arrow, Arrow PRO, & More!